I started sitting down to write this post right after I just ate the last piece of this cake. I think the overriding thought I have is that a little dessert - a little something sweet - just makes the day a bit better. So since it's February and Valentine's day is circled in red on the calendar, and more importantly, because chocolate is a beautiful part of my everyday life that I wouldn't want to live without, let's make and savor another chocolate cake and make life just a touch sweeter. At this point, I think I've established the basis of my favorite things so this is going to sound familiar. This small 6-inch cake is essentially a flourless chocolate cake (a cake we adore that I most recently made a couple of weeks ago after realizing I'd neglected it for too long), with the addition of chestnut cream. The chestnut cream lends extra moisture and adds a sweet nuttiness that I love. It makes the cake a bit heftier or denser compared to a regular flourless chocolate cake, in a wonderful way by giving it a satisfying mouthfeel. The texture is very smooth and velvety, with a creaminess that has substance to it. I know I like to find all sorts of ways to bake with chocolate and chestnut cream and, in fact, I made a very similar torte two Christmases ago using a recipe that started with chestnut puree (something I accidentally bought and wasn't at first sure what to do with) rather than chestnut cream. 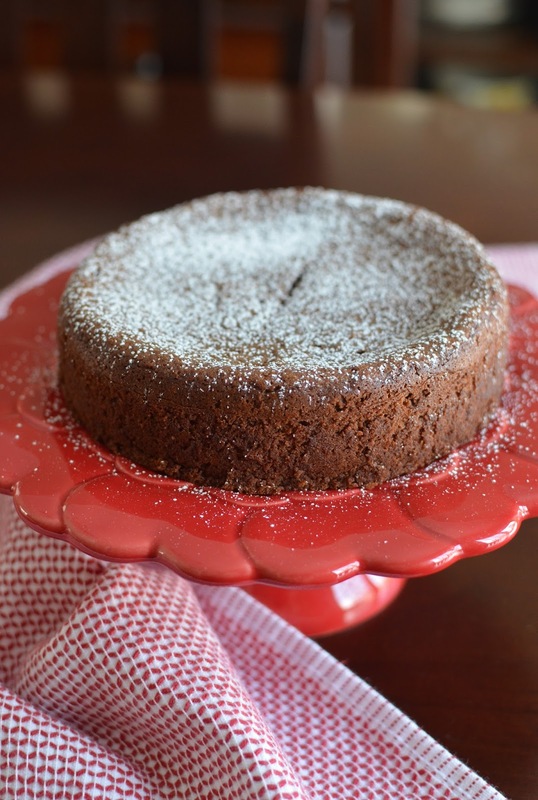 This cake, using chestnut cream, is even easier to make! And since I have plenty of chestnut cream on hand, this little cake will not be a stranger in my house. In fact, I may not divide the recipe in half next time to make just a 6-inch version; it's definitely special enough for a dinner party. I was looking for a simple, familiar recipe for chocolate-chestnut cake and settled for this one that's essentially a flourless chocolate cake recipe with the addition of chestnut cream. It only involves a handful of ingredients, which is a big lure for me. I adapted the recipe slightly, first dividing it in half to bake in a 6 inch (rather than 8-inch) pan. I rounded down the amount of butter and rounded up the amount of chocolate in the recipe and added a splash of vanilla extract. You could also flavor it a bit further with a little rum if you like. You might notice that the recipe does not call for sugar. The chestnut cream provides plenty of sweetness so it's not needed. Just bear in mind that without sugar to stabilize the egg whites, be careful not to over whip the egg whites (I did it by hand in a large bowl, and this gave me better control over it) or it will become dry and separate; that makes it hard to fold the whites into the batter and it won't do its job of lifting the cake and lightening it the way you want. The moist, fudgy, sweet chocolate-chestnut cake is perfect with just a dusting of confectioners' sugar (or unsweetened cocoa powder) and really doesn't need anything else with it. I have to say it tastes like Christmas to me though I'm using Valentine's Day as an excuse! It's not too heavy or as rich as it might look so consider doubling the recipe below and baking an 8-inch cake instead. It's also the kind of cake that holds well for a few days. I like to store it in the refrigerator and just set it out to sit at room temperature for a bit before serving. Happy February! I think it's going to be a sweet month for us all. Preheat oven to 350 degrees. Butter a 6-inch round cake pan (I used one with removable sides but it's not mandatory) and line the bottom with a round of parchment, lightly greasing the paper. Place chocolate and butter in a heatproof bowl set on top of a pan of just simmering water. Stir until melted, then remove from the pan and let cool slightly. Then stir in the chestnut cream, vanilla extract, and egg yolks. In a large bowl, whisk the egg whites with a pinch of salt until it just reaches stiff peaks (be careful not to over-whip the whites or it will separate). Fold 1/3 of the egg whites into the chocolate-chestnut cream mixture to lighten the batter. Then fold it the rest until just incorporated. Transfer batter into the prepared cake pan, smoothing over the top. Bake until cake is just set, approximately 30 minutes. Let cake cool on a baking rack before removing from the pan. Dust the top with confectioners' sugar. Absolute pure decadence! Seriously moist and so delicious. You are lucky we are not neighbors or I would be inviting myself over for a slice. Do you know if chestnut cream has dairy in it or not? Probably, right? I have only worked with chestnut paste before. It is very satisfying...the chestnut cream gives it a little more bulk in a great way. Such a great question about the chestnut cream. As far as I can tell, the chestnut cream I buy and use does *not* have dairy in it...the ingredients are: chestnuts, sugar, vanilla. I believe it's made with mashed, cooked chestnuts that's pureed with a sugar syrup. That said, however, the recipes for *homemade* chestnut cream I've seen all seem to call for cream as an ingredient! I've never had chestnut cream before, but this cake looks incredible, so I guess I need to try it ASAP! Hope you try it one day soon, thank you! I just can't take my eyes off that gooey texture..heavenly! I know it...it's so moist...it could go for days in the fridge but doesn't last that long! I love flourless chocolate cake! It's so rich with intense chocolate flavor! I'm drooling looking at the slice of your cake - perfect texture, so gorgeous! We love it for those reasons, too. My husband particularly adores it and I'd realized a couple weeks ago that I hadn't made one in too long. Now we have this version as well. : ) Thank you, Melanie. Mmmm, love anything chocolate. And I am so in love with this ooey gooey flourless cake. Absolutely loved the idea of chestnut cream. A little something sweet definitely makes any day better! I still really need to get my hands on chestnut cream! I think this every time you post something with it! haha These cakes sound so so good!! This cake looks absolutely superb, Monica! I've never come across chestnut cream here in Australia, but when I do, I know what I'll be making with it!! OH my Monica - I nearly gasped at the texture of this cake. I am practically drooling it looks so good. You and that chestnut cream! You should be award a lifetime supply for the beautiful desserts you make. Thank you for sharing with us! The combination of chocolate and chestnut sound delicious Monica...and the texture of this cake is just perfect...moist and tender...perfect with a cup of tea. The texture was definitely a favorite aspect of this. You have a great one, Juliana. I like such cakes that are not too heavy and can hold for few days. Save a big piece for me. haha - yes! I do adore cakes that keep well. Have a nice week! Monica, do you buy chestnut cream online? Hi Bal - I discovered chestnut cream a couple years ago in Paris and bought home a few that lasted me for a while. Then, yes, I think I ordered it once via amazon (see link in recipe) and also got lucky finding it in an Italian grocer (but then they no longer had it on a second visit). My sister recently went to Paris and she brought back a ton for me so I'm well stocked now. All that said, amazon is the best bet. I want to try this cake and will see if I get chestnut cream from specialty store where I shop. Yum! 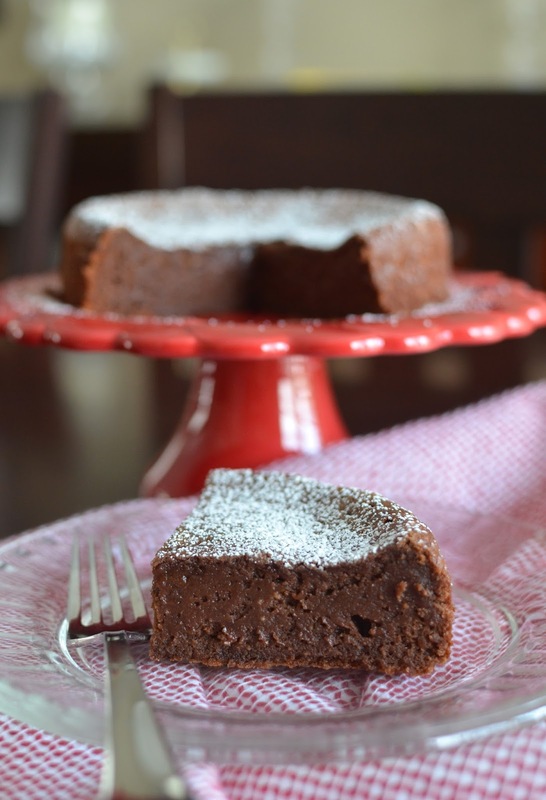 Fudgy moist chocolate cake with chestnut cream aaand gluten free? What a great treat! (: The powdered sugar dusting is the perfect topping. Have you considered a baking with chestnut cream cookbook? I am not even kidding, Monica. Your love of that ingredient makes you uniquely able to incorporate it into a variety of luscious treats. This gorgeous cake is the most recent example. The texture looks heavenly. : ) Thank you, Wendy...I think my capability caps with the ability to "compile" a bunch of recipes and I hope I'm essentially doing that here. I'm thrilled to discover these recipes and I'm amazed I can comfortably makes some tweaks these days to suit my needs and preferences. I really did adore the texture of this cake. The chestnut cream! Japanese loves chestnuts in western (well, Japanese too) sweets, and I love it so much! I'm even more interested in this chocolate cake because of "chestnut" in the recipe. :D Very exciting! And I like your quote from this post - a little something sweet - just makes the day a bit better. For someone who doesn't know how to control the portion when it comes to sweet, this is a great quote to keep in mind. It's really true and I'm going to remember that. I wish I can have a slice of this cake!!! Oh Nami - I wish chestnut desserts were more common/popular so I'd have more, more recipes to try out! This was a great little cake. And I totally hear you on the portion control...I am a volume eater - I like big portions and one thing I noticed that helps me is to cut myself a smaller portion of cake, etc. because I *will* most likely eat whatever's on my plate otherwise! I try to stuff myself with healthy food and then enjoy some chocolate, a good dessert afterwards at night. It really does make me feel so much better, having that something sweet. Life is short...gotta enjoy it and sometimes it means cake!